Books Inc. was established in 1938 by Lewis Mulford Adams, who had been president of the printer J.J. Little & Ives Company (1916-1931), established the Kingsport (Tennessee) Press (1923) and Colonial Press, Inc. (1931). Books, Inc. was a purveyor of very cheap, copyright-free hardcover reprint books from the late 1930s onward. They advertised in periodicals such as Chain Store Age, suggesting their books were aimed at department stores, grocery stores, dime stores, etc. 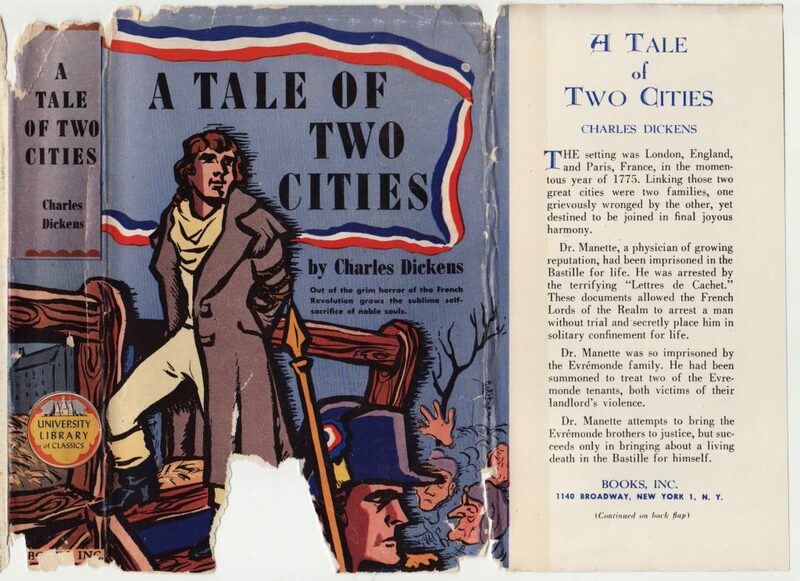 Books, Inc.’s University Library of Classics was nothing more than books from their World’s Popular Classics series with a different dust jacket. 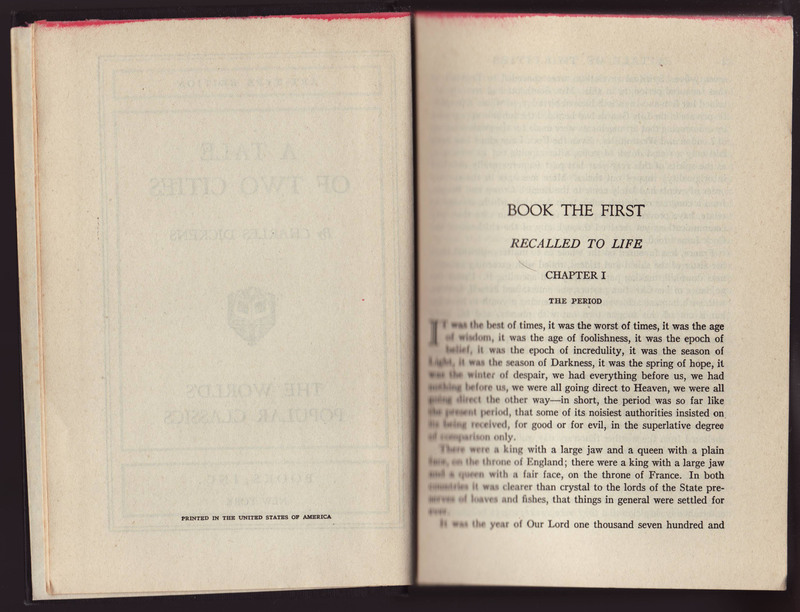 Indeed, the books themselves (see below) indicate World’s Popular Classics on the title page. It is not clear why the differing series name (on the same books) was needed, but it was possible that the University Library of Classics was made “exclusively” for a particular department store or other similar retail outlets. 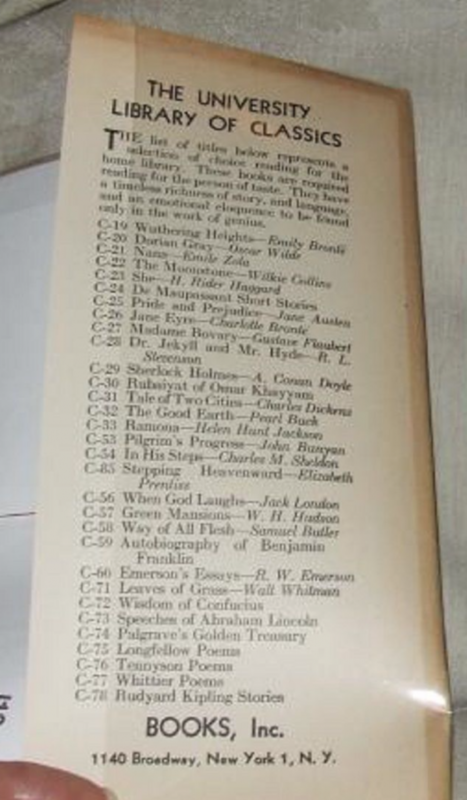 The rear flap of a title from the Books, Inc. series Books for Boys and Girls dated 1950 (left, click to enlarge) includes a list of titles in the University Library of Classics up to serial number 78. The serial number of the book below (A Tale of Two Cities) is C-31, but that number is not to be found anywhere on the book’s jacket or in the book itself. 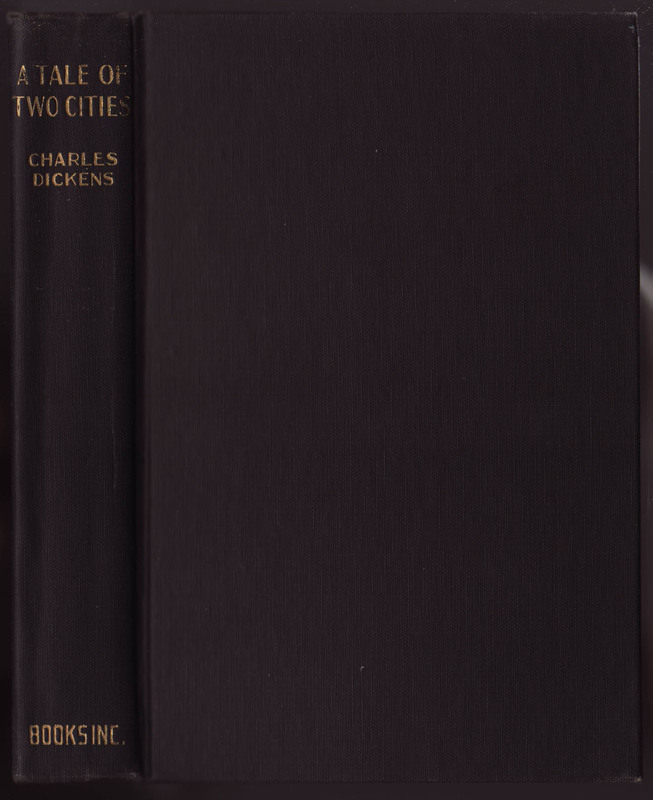 Jackets are unique to each title, as in this case of Dicken’s A Tale of Two Cities. The book is undated, but probably late 1940s or early 1950s. The only place the series name appears on the jacket or book is the jacket spine. A synopsis of the book appears on the jacket flap, continued on the rear flap. 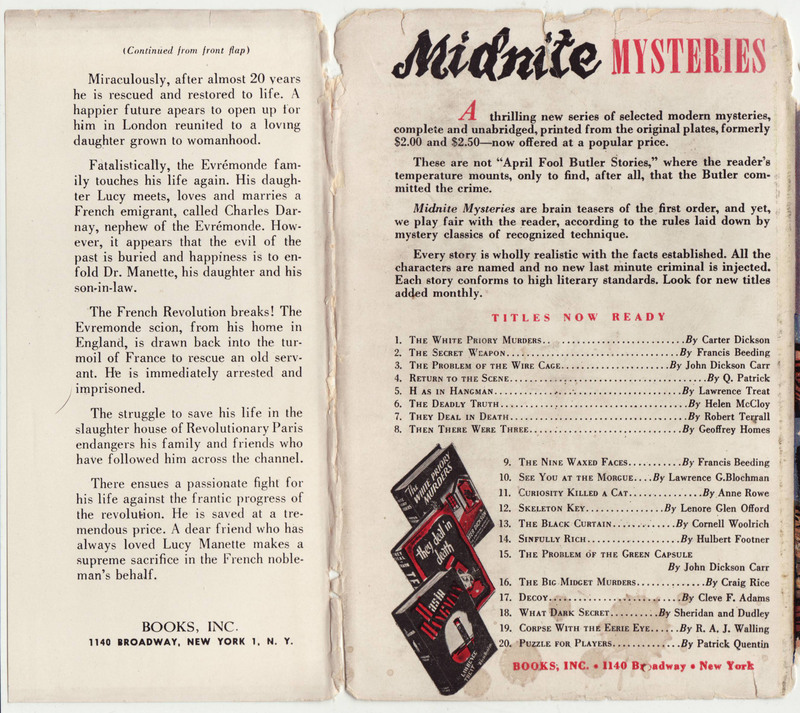 The rear of the jacket advertises the 20 titles in the Midnight Mysteries, a series sold from the mid-1940s through mid-1950s. Bindings are black, cloth, and minimalist in design. There is no half-title page. 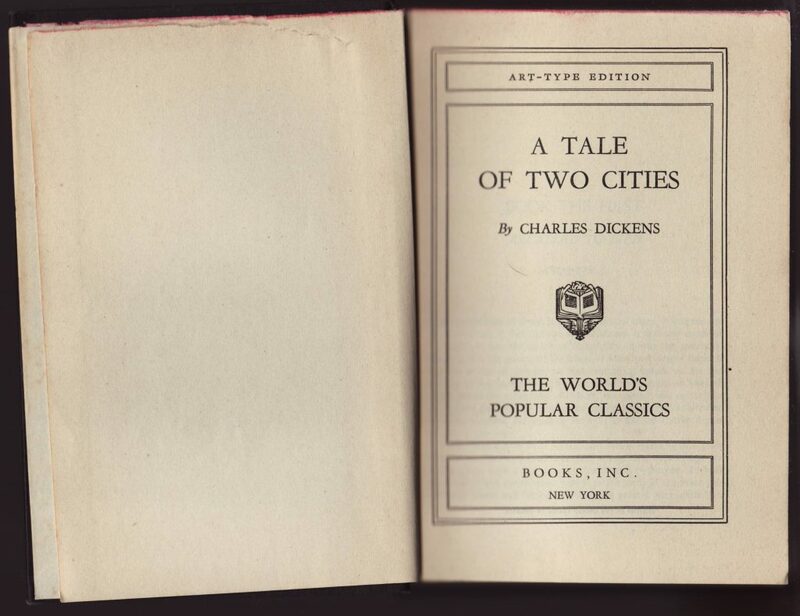 The title page is identical to that of the World’s Popular Classics. The copyright page includes only an indication of manufacturing in the U.S.